"Касабланка" - голливудская романтическая кинодрама 1942 года, поставленная режиссёром Майклом Кёртисом с Хамфри Богартом и Ингрид Бергман в главных ролях. Действие фильма разворачивается в начале Второй мировой войны в марокканском городе Касабланке, находившемся в то время под контролем вишистской Франции. Сюжет сосредоточен на внутреннем конфликте человека, которому приходится выбирать между долгом и чувством, между любимой женщиной и необходимостью помочь ей и её мужу, лидеру движения Сопротивления, бежать из Касабланки для продолжения борьбы с нацистами. 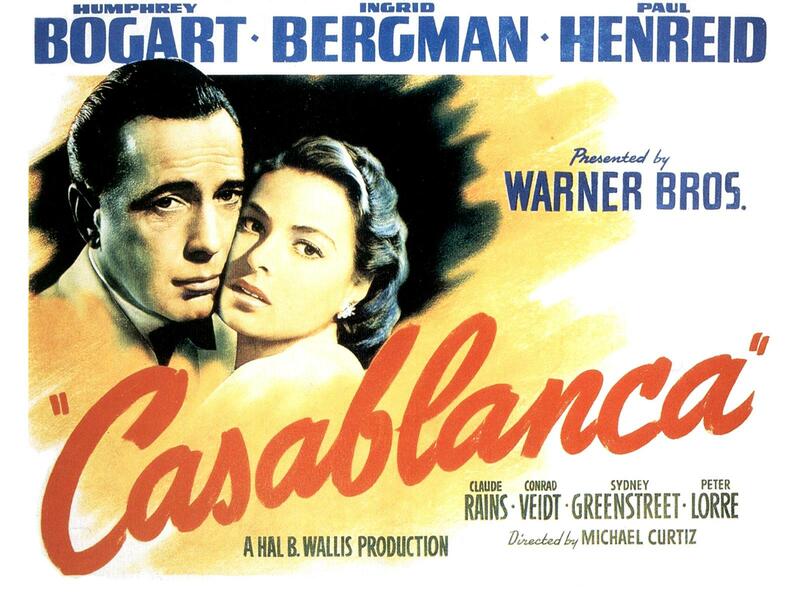 Because I first saw “Casablanca” at the age of ten, it pretty much is responsible for forming my idea of capital-R Romance. Of course, the Romance in “Casablanca” is a doomed romance, but then, probably all romances are doomed romances if you think about it for too long — or, alternately, if you think about it for just the right amount. Or is that too profound? Probably it’s too profound. Anyway; let’s not get into that whole thing right now. Anyway – play the ‘Marseillaise.’ …Play it! 1. “…Here’s looking at you, kid”. 2. “Kiss me. Kiss me as if it were the last time”. 5. “…If we stop breathing, we’ll die. If we stop fighting our enemies, the world will die”. 6. “Round up the usual suspects”. 7. “Just because you despise me, you are the only one I trust”. 8. “Not an easy day to forget”. “…I remember every detail. The Germans wore gray, you wore blue”. 10. “You know how you sound…? Like a man who’s trying to convince himself of something he doesn’t believe in his heart”. 11. “Where were you last night?” “…That’s so long ago, I don’t remember”. 12. “Will I see you tonight?” “…I never make plans that far ahead”. 14. “What is your nationality?” “…I’m a drunkard”. 17. “Remember, this gun is pointed right at your heart.” “…That’s my least vulnerable spot”. 18. “Welcome back to the fight. This time I know our side will win”. 21. “What if you killed all of us? From every corner of Europe, hundreds, thousands would rise up to take our places. Even Nazis can’t kill that fast”. 23. “Why did you have to come to Casablanca? There are other places”. 24. “Go ahead and shoot. You’ll be doing me a favor”. 25. “You despise me, don’t you?” “…If I gave you any thought, I probably would”. 26. “When it comes to women, you’re a true democrat”. 27. “I’m the only cause I’m interested in”. 28. “Major Strasser’s been shot.” (Glances at Rick, holding the smoking gun, and he repeats–) “…Round up the usual suspects”. 29. “Louie, I think this is the beginning of a beautiful friendship”. 36. “Well, I ain’t sleepy either”. 37. “You know what I want to hear. 41. “…Who are you really, and what were you before? What did you do and what did you think, huh?” “…We said no questions”. 42. (Standing in front of the plane in the fog.) “I’m saying this because it’s true. Inside of us, we both know you belong with Victor. You’re part of his work, the thing that keeps him going. If that plane leaves the ground and you’re not with him, you’ll regret it. Maybe not today. Maybe not tomorrow, but soon and for the rest of your life”. 44. “We’ll always have Paris. We didn’t have, we, we lost it until you came to Casablanca. We got it back last night”. 46. “And you never will. But I’ve got a job to do, too. Where I’m going, you can’t follow. What I’ve got to do, you can’t be any part of. Ilsa, I’m no good at being noble, but it doesn’t take much to see that the problems of three little people don’t amount to a hill of beans in this crazy world. Someday you’ll understand that”. 50. “Here’s looking at you, kid”.